Your comprehensive Grand Canyon day trip begins as you fly in a Cessna airplane to the West Rim of the canyon. As you listen to the narration, you’ll enjoy unobstructed views of the canyon and other fabulous Arizona landscapes. Have lunch at Guano Point (included) on the rim of the Grand Canyon, and do a little hiking if you wish. The views of the canyon and the Colorado River a mile below are spectacular. 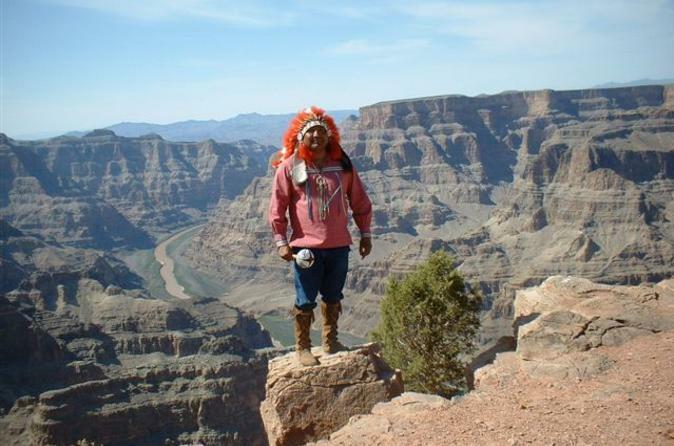 During the tour, you’ll visit Eagle Point and a village of authentic Native American homes; enjoy a Native American cultural performance; and walk out on the Skywalk – the canyon’s most exciting attraction. This platform extends out over the edge of the canyon, providing heart-racing views of the canyon floor beneath you. Also included is a seven-minute helicopter ride down to the floor of the canyon, where you’ll walk briefly to the edge of the Colorado River and hop on a pontoon boat for a leisurely 15-minute ride on the water. The canyon cliffs will tower above you as you soak in the incredible beauty. Your flight back to the rim of the canyon will reconnect you with your airplane pilot for your return flight to Phoenix.